Eastern Mediterranean: The coastline shows (NW) the Aegean, (N) the S. coast of Turkey & the island of Cyprus. Countries on the Eastern seaboard (N to S) Syria, Lebanon, Israel. To the WEST of the peninsula - the Gulf of Suez. To the north of this gulf, the canal runs from the town of Suez, into the Mediterranean at Port Said. 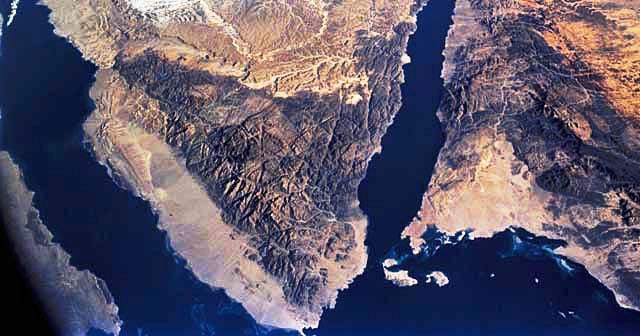 To the EAST of the peninsula, the Gulf of Aqaba follows the Great Rift north. The towns of Eilat & Aqaba are at the Northern tip. 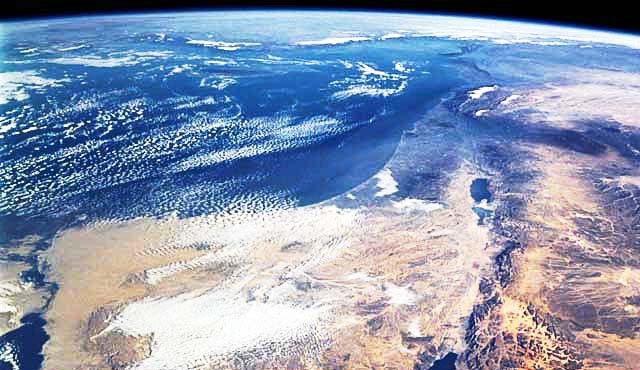 The Rift continues NORTH - up the Aqaba valley, through the Dead Sea & up the Jordan Valley, & SOUTH - down the Continent of Africa into the Eastern Transvaal in the Republic of S. Africa.